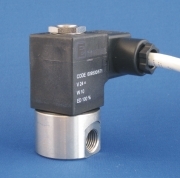 The Nereus VAL-12/24V-PS gas solenoid valves contain a micro-circuit to reduce power consumption and improve reliability. The circuit provides a pulse of current for a few seconds to open the valve and then automatically reduces to a much lower ‘holding’ current. This system provides a reliable on/off switching action over the full voltage range with much reduced power consumption. These valves feature a stainless steel body and also run much cooler than normal solenoid valves which improves their reliability. Valves are supplied fitted with 1m of marine grade cable.